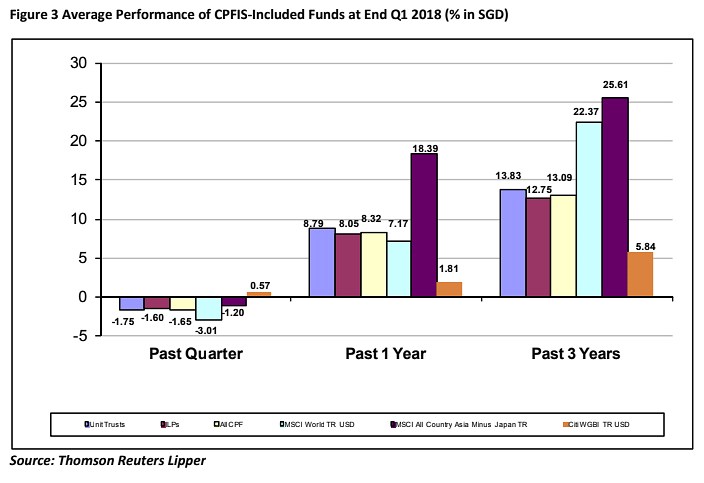 SINGAPORE - Unit trusts and investment-linked insurance products (ILPs) included under the Central Provident Fund Investment Scheme (CPFIS) yielded negative returns of 1.65 per cent on average in the first quarter of 2018. Specifically, unit trusts included under the CPFIS - a scheme where members can put their CPF savings in various financial instruments - yielded negative returns of 1.75 per cent in Q1, while returns on ILPs were down 1.6 per cent. For all CPFIS-included funds, money market funds yielded positive returns of 0.2 per cent, while equities and mixed asset posted negative returns of 1.84 per cent and 1.77 per cent respectively, and bonds slipped 0.78 per cent. In the same period, benchmark index MSCI AC Asia ex-Japan index was down 1.2 per cent, while Citigroup WGBI TR rose 0.57 per cent, said Thomson Reuters Lipper, which monitors the data. For the one-year period ended March 2018, however, the overall performance of CPFIS-included funds was positive, posting average returns of 8.32 per cent. CPFIS-included unit trusts rallied 8.79 per cent, and CPFIS-included ILPs rose 8.05 per cent. On average, equities (up 10.75 per cent) outperformed bond offerings (up 1.05 per cent), mixed asset (up 6.54 per cent) and money market funds (up 0.67 per cent). In the three-year period ended March 2018, CPFIS-included funds grew 13.09 per cent on average, accounted for by a gain of 13.83 per cent from CPFIS-included unit trusts and 12.75 per cent from CPFIS-included ILPs. Equities were the lead gainer, growing 15.97 per cent, while bond offerings posted average returns of 5.12 per cent. "Global markets are aware of the geopolitical developments around the world. Attention is on the developments and results of US-China trade discussions," said head of Asia-Pacific research at Thomson Reuters Lipper Xav Feng. "Moreover, the US Personal Consumption Expenditures index rose to 2 per cent year over year from a 1.7 per cent pace in February, signalling inflation and reinforcing expectations of an interest rate hike in June. Investors are advised to continue monitoring potential volatility risk under these circumstances," he added.